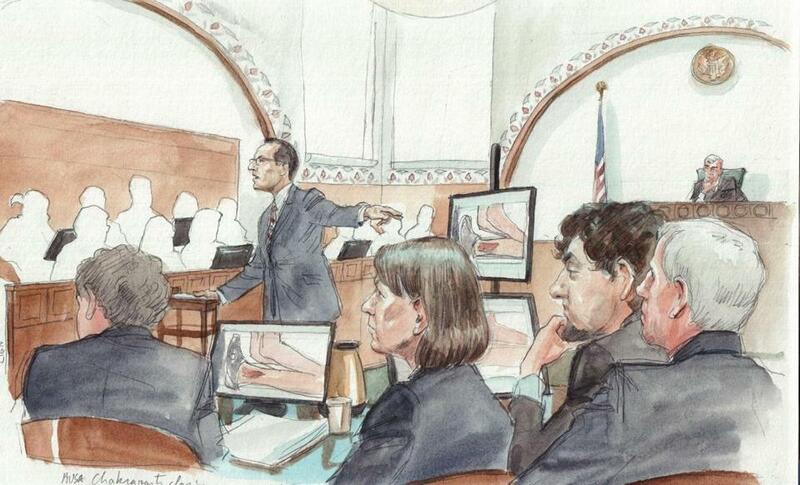 Aloke Chakravarty delivered the prosecution&apos;s closing argument in the trial of Dzhokhar Tsarnaev. A federal prosecutor on Monday described Dzhokhar Tsarnaev as a cold-blooded killer determined to attack the Boston Marathon – a terrorist who not only read militant propaganda on the Internet, but who embraced it. “He believed in it enough to murder people,” Assistant US Attorney William Weinreb told jurors during his closing argument in Tsarnaev’s death-penalty trial in federal court in Boston. Repeating the startling admission she made at the beginning of the trial, Tsarnaev’s defense attorney acknowledged to jurors that Tsarnaev participated in the bombings of the Boston Marathon, the killing of a police officer several days later, and in a firefight with police in Watertown, where he threw bombs at police officers. But the attorney, Judy Clarke, asked jurors to see her client, who was then 19, as an “adolescent” who was misguided in following his older brother in life, and onto Boylston Street on April 15, 2013, where he set off a bomb in a crowd of people watching the race. “Tamerlan led and [Dzhokhar] followed,” Clarke said. The federal indictment against Tsarnaev lays out 30 charges, 17 of which carry a possible death penalty. “We don’t deny that Dzhokhar fully participated in the events, but if not for Tamerlan, it would not have happened,” she said, making an argument that will probably be a focus in the next stage of the trial, when jurors would decide what Tsarnaev’s punishment should be. The jury of seven women and five men is slated to begin deliberations Tuesday morning. Monday’s closing arguments, spanning four hours, allowed prosecutors and defense attorneys to summarize the testimony of 95 witnesses and the evidence presented over 16 days. Three people were killed in the Marathon explosions, and more than 260 people were injured, including 17 people who lost limbs. The Tsarnaev brothers also killed MIT police Officer Sean Collier days after the bombing, carjacked a Chinese entrepreneur, and engaged police in a firefight in Watertown. Tamerlan Tsarnaev died after he was shot by police, then hit by his brother driving a stolen SUV and dragged for roughly 30 feet. Dzhokhar Tsarnaev was struck by gunfire during his escape from police, and was found more than 17 hours later, hiding in a boat parked in a backyard a few blocks away. As he hid in the boat, Tsarnaev wrote a justification for the Marathon bombings on an inside wall of the boat, explaining that the attack was committed as retribution for US military involvement in Muslim lands. Chakravarty stood a few feet from Tsarnaev, and pointed at him. “He wanted to tell the world why he did it and he wanted to take credit, he wanted to justify it,” Chakravarty told jurors. For more than an hour, Chakravarty recounted the testimony of bombing survivors including William Richard, who described his frantic efforts to help his daughter, while his wife tended to their dying son, 8-year-old Martin. William Richard and his wife, Denise, were in the courtroom Monday. Chakravarty played videos of the chaos at the finish line after the bombs exploded, showed a photo of Krystle Marie Campbell, who was killed by the first explosion, lying on the ground. He recalled the testimony of Danling Zhou, who saw a hole blown through her friend Lingzi Lu’s leg. Lu died of her injuries. “The defendant killed her, too,” Chakravarty said. He told jurors that the brothers killed Collier and tried in vain to take his gun. They carjacked Dun Meng, and planned to drive his SUV to New York City to detonate more bombs. They had stockpiled another pressure cooker bomb and four pipe bombs, and had explosive powder in another container. The brothers also had the gun they used to kill Collier. Chakravarty said the brothers had not realized police would so quickly track them to Watertown, where they had driven after Meng escaped. Chakravarty recounted the testimony of a police sergeant who saw Tsarnaev throw a pressure cooker bomb at officers. “He described how it shook him to his knees,” Chakravarty said. He said the firefight directly led to the injuries of MBTA police Officer Richard Donohue, who nearly died. Donohue seemed to be hit by crossfire, but Chakravarty told jurors, “that chain of events would not have happened, and Officer Donohue would not have been injured” if it weren’t for Tsarnaev. One of the charges Tsarnaev faces relates to Donohue’s injuries. Chakravarty said Tsarnaev’s state of mind was still sound enough for him to destroy two cellphones after he escaped from police, and for him to write the message in the boat. “Stop killing our innocent people and we will stop,” he quoted from the note. Of the 30 charges Tsarnaev faces, several — including those that allow for the death penalty — are based on the theory that the crimes were motivated by a terrorist ideology. At the end of his arguments, Chakravarty played a multimedia presentation for jurors that included a nasheed – or musical chant – associated with Anwar Al-Awlaki, an Al Qaeda propagandist who used the Internet to spread his message. The music, found on Tsarnaev’s electronic devices, was played as video and photos from the Marathon carnage was displayed for jurors on video monitors. Clarke, in a closing argument that lasted about 45 minutes, highlighted testimony – much of it from government witnesses – that suggested that Tamerlan Tsarnaev was the more radical of the two brothers. He was the one, she said, who first downloaded Inspire magazine, a publication of Al Qaeda that offered instructions on how to build a bomb. She also said that receipts from Walmart, Target, and from online purchases show that Tamerlan was the one who acquired the materials to make the bombs. Dzhokhar Tsarnaev was at the University of Massachusetts Dartmouth during much of that time. “They’re both different people who thought differently, acted differently, and had a different role in the conspiracy,” she said. Clarke said she would not deny what Tsarnaev did, but said prosecutors were overstating his role. For instance, prosecutors said he purposely placed the bomb behind a group of children, but she argued that he had randomly stopped at a tree. “It doesn’t make it better, but let’s not make his intent any worse than it was,” Clarke said. Weinreb, who made the government’s rebuttal statements, told jurors that Tsarnaev was trying to dodge responsibility.